"Many hands make light work" is a suitable motto for the new Crown Support from Bench Dog Tools. What used to require an assistant and a second ladder is now portable, permanent and unfailingly reliable. 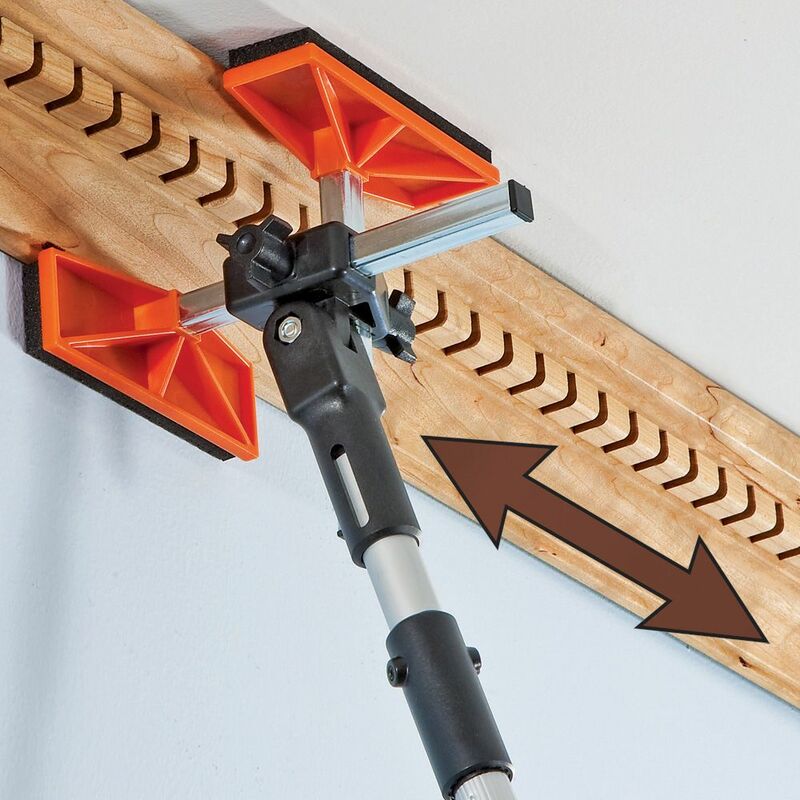 Unlike similar products on the market, the Bench Dog Crown Support straddles the molding, leaving the installer free to slide the molding and adjust it for the tightest joint possible. 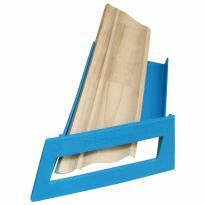 This eliminates the need for climbing down the ladder and adjusting the molding support device. 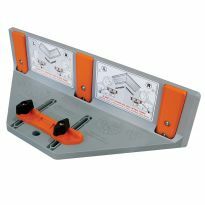 The soft support pads are fully adjustable to accommodate crown moldings from 1-1/2" to 8" wide. Once adjusted, the support assembly swivels and wedges against the wall and ceiling, providing a secure hold with no risk of marring. Built from top quality materials, and with entirely tool-free adjustments. 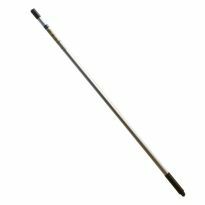 The Crown Support threads onto most standard painter's poles, as well as the new 12' Telescoping Pole (#31337, sold separately). 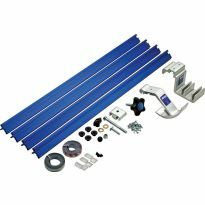 A separate adapter (#33940, sold separately) is also available that allows the Crown Support to be used with the FastCap® 3rd Hand Extension, a support pole that many carpenters already own. Patent Pending. This tool allowed me to install 4 - 9/16" crown moulding up to 16' long by myself. The ability to do this without having to ask my wife each time I needed to test fit and then install the crown moulding saved time and preventing my having to interrupt her activities all during the day. We are replacing all the crown in our house and will complete much more quickly than without this simple but effective tool. VERY SATISFIED WITH THIS CROWN MOLDING SUPPORT. THANK YOU ROCKLER!?????? THIS SUPPORT WAS VERY HELPFUL. THIS WAS MY FIRST TIME USING IT AND I WAS IMPRESSED HOW SIMPLE IT WAS TO USE. BUT THANKS TO THE CIRCUMSTANCES OF NOT BEING ABLE TO FIND A HELPER FOR THIS JOB LED ME TO PURCHASE THIS CROWN MOLDING SUPPORT. 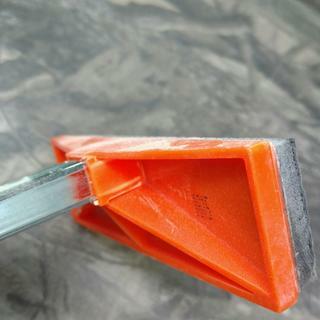 This tool is a great help when installing crown or trim near the ceiling. I used one of my painter pole extensions to support it and it worked well. I was finally able to install crown without asking my wife for help. I highly recommend this. Gteat product and solution for doing crown molding on your own. Great tool for one person. Using this product allowed me to do two 12x14 rooms alone in under two hours. I used a scrap piece of crown to set the corners, with nice results. I'm now buying another clamp to allow me to use actual stock when setting corners. Amazing product! Will serve well as an aid to install crown moldings as I work as a &quot;1-man Show&quot;. The &quot;third Hand&quot; will make the job easier also. Very nicely made product. Makes doing crown molding easier on the back. Working at ceiling height is not all that easy and this makes it much faster and easier to get the crown installed right. I am in the process of putting up my first crown molding and this item was just the thing, that extra pair of hands was great. It is easy to use and the ability to actually position/slide the molding while I was on the ladder save a lot of time and frustration. It works, but i used a paint pole, which required adding a rubber chair leg tip cover to the end. The pole they sell would need one as well. Useful tool but not very well made. Supports functioned as advertised. Thought I would try these rather than making my own as I usually do when I work alone. Also purchased the telescoping handles which work fine with the molding support. 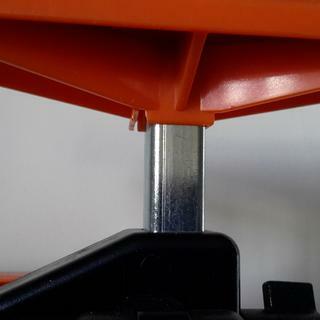 What I found is the orange plastic pad supports are very thin material and break easily where it connects to the adjustable shaft tube. Returned one set when it broke, new set cracked after a days use. Rather than returning them again I repaired it with epoxy. Not sure how long they will actually hold up under constant use. It worked great once I figured out how I need to use it on my application. Yes I would recommend it to ny one that needed a helping hand on crown work. I found this product very useful as I was putting up the crown moulding alone no help to hold the other side .Once it is adjusted to size of crown it held it in place . it takes a little time to get used to using it. I used it on hardwood floors and the handle would slip there should be a rubber foot on the handle instead of the plastic end cap with a hanging loop on the end to keep it from sliding on floors. I used a rubber cup like used under furniture legs to keep it from sliding.I placed a rubber walking cane on end it works great now. Choose this or a 2 x 4 cut to length. This did okay, but not much better than a 2 x 4 cut to length and propped under the crown. If you're running inexpensive crown, by all means, do it by yourself with this or a 2 x 4. If you're running expensive crown get a helper. It worked, was helpful but could use some improvement. With 14 ft. pieces of 5 1/4 in. crown molding to put up this was a help (in addition to a 2nd person) in helping stabilize and hold molding in position while nailing. Pads were good, adjustability of the head was fair. It screws onto a standard painting pole head....but finding a long and adjustable pole is a challenge. Device works great, 2000 ft of crown by myself. However, not tough enough. Working jobsite had pole retracted and leaning against wall got bumped hit the floor one time and was damaged. Needs to be made tougher. We Purchase te XTRA Hand Crown Support ad the arms could not be tighten down to stay in place. 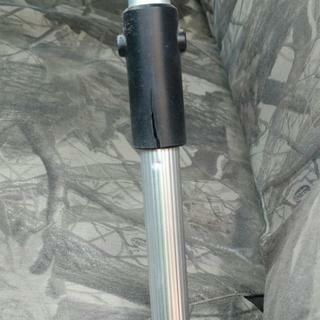 Also the Telescoping Pole could not be tighten to keep the Support and pole in line. Why my wife was holding the pole and Support the pole coupling broke on the pole sending her end to the floor. The concept is good the material (plastic and the twist nuts are not good). of plastic which creates problems with long and wider moulding. longer and heavier crown moulding. I work alone, looks like it may be a big help. Do A lot of crown and hard to find helpers to get job done. To hold crown molding with out other person.abd make installation easy. As an experienced remodeler, I work by myself. We are remodeling two houses and I will be working alone most of the time and will need all the help I can use. Looks like it will work well with the crown molding I'm going to install. Like the dbl surface support and the versatility of molding size. Have not used yet, but will soon. When you work alone this is a no brainer. I may purchase 2 more if they work out. I work alone, and already installed two rooms of crown molding. I think this will make the job a lot easier. Because I am undertaking my 1st crown molding project ... on my own house, alone. Need to install crown molding shortly. i liked the way it looked. i'm a contractor. Very handy tool when you need that extra hand. Price is reasonable for a must have tool. I've always wanted to put up Crown Molding and this looks like it would help stabilize it. My fiance puts up alot of crown and this will help him in his work. I will be doing crown molding around the ceilings in my house. Have a crown molding job to do, this will make it a simpler process. I work on my own, so need a "second" hand. This seems like a perfect helper. Rocker has good reputation. Have used Rockler before. High quality tools. Third-hand type tools always come in handy. 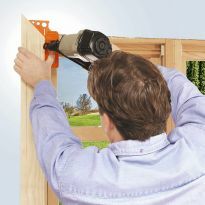 This one will make trim installation much easier. Because I don't have a third arm. 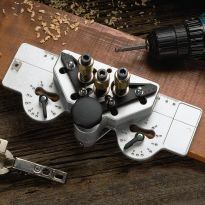 I have been looking for something like this and I trust Rockler. To help me take a small cabinet down off the kitchen wall. I'm doing this alone. This provides "another pair of hands." Read the reviews and thought I would try this product to help install crown molding by myself. I will be installing crown molding in numerous rooms as part of a major remodeling project. This molding support will allow me to complete this task without having to recruit a friend or relative to hold the other end of the molding. I got this for doing crown and it has helped when I am working alone. Hanging 16' crown alone is impossible. This product will be a lifesaver! Good product, can't find anywhere else. Doing some 16' crown work by myself and needed the extra support. Will it fit a painter's pole? BEST ANSWER: Yes, but it is not ideal. I used mine on a painters pole at first because my pole I ordered with it was on back order. If your pole is like mine, it has notched positions and I could not get the ideal angle to hole my crown molding. The pole that you get thru Rockler telescopes to any position. 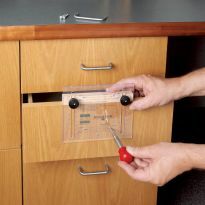 You rotate it to lock in place at any position. 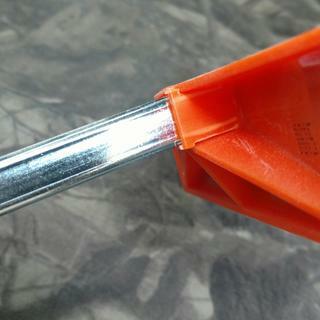 The tool screws into a painters pole, that is what I used to attach the crown moulding support tool. Yes... That's how I use it. How many crown molding support do I need to install crown molding by my self, is it needed on both ends? BEST ANSWER: Ideally you need to wupport both ends of the workpiece. If it were short, you coould support from the middle, but on a longer piece, you probably would not be happy with the results (i.e your ends might not line up perfectly. I used only one to do it myself. Can it be as a deadman for supporting coffered ceilings ? BEST ANSWER: If you already have the box beams in place, yes. 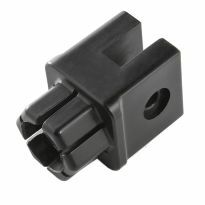 The unit utilizes two point contact. It works great for the cove molding. I have not tried it but you might be able to utilize it as a dead man but you would have to hold the board up and be able to adjust the telescope pole at the same time. If you had two units and some 1/2" square tubing, you could create a bridge and then adjust it against the ceiling to create a dead man. I have two of these, so I might try it. I have never used for that application, but with the flexibility this tool has, I don't know why you couldn't. If you use this tool with an adjustable support and your beam isn't too heavy, I would give it a try.